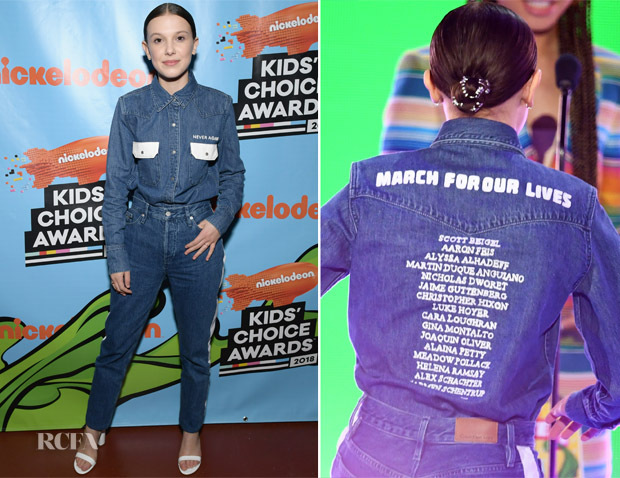 Millie Bobbie Brown made a compelling statement through her style at the Nickelodeon 2018 Kids’ Choice Awards on Saturday (March 24) in Inglewood, California. From a distance, and from the front, you may just see a particularly cool-girl version of the Canadian tuxedo. But, look closer, and the pieces are actually in tribute to the 17 victims of the Parkland shooting, with the victims’ names written on the back. ‘Never Again’ is written the front, and it was such a fitting way to use fashion as a force for good on the March for Our Lives demonstrations day.